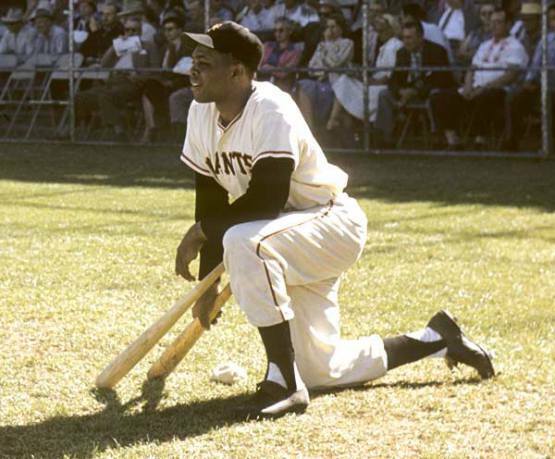 Willie Mays watches the pitcher from the on deck circle. circa 1957. One of my fondest childhood memories was watching Willie Mays with the San Francisco Giants play baseball in the very early 1970s. I remember one instance in which Mays—one of the most gifted, exciting baseball players of all time—chased a hit ball deep into the outfield where he and Bobby Bonds both went for the catch against a chain link fence at Candlestick Park. Mays leapt higher and one-handed it. Unfortunately, Mays was injured in the collision but he robbed Cincinnati Reds outfielder Bobby Tolan of a home run. Here is the catch. I remember it like yesterday. It was Saturday “Game of the Week” on NBC with Joe Garagiola and Tony Kubek providing the play by play on April 11, 1970. That was a time when there were not nearly as many opportunities to views games on television. I set aside every Saturday afternoon as a high schooler to watch the best teams in baseball from around Major League Baseball. In Greenville, S.C., where I grew up, we occasionally saw televised Atlanta Braves games, but otherwise, there was nothing available other than the “Game of the Week.” It was my winder into the joy of watching Willie Mays play baseball, and I was never disappointed. An African American child growing up in the Deep South during the Jim Crow era, left an indelible mark on Mays. Born in 1931 Mays began playing baseball with his father when just a small boy and by age 16 he had signed to play with the Birmingham Black Barons in a segregated league. His father insisted that he finish high school, but on the day Mays graduated the New York Giants signed him to a contract. Sent to the far north—the Giants’ Class B farm team in Trenton, New Jersey, and later the AAA Minneapolis Millers—he went to the MLB club in New York City in 1951 when still only 20 years old. Although Mays was viewed as a “natural” he got off to an inauspicious start, batting 0 for 12 at first before cranking a home run over the left field roof of the Polo Grounds. 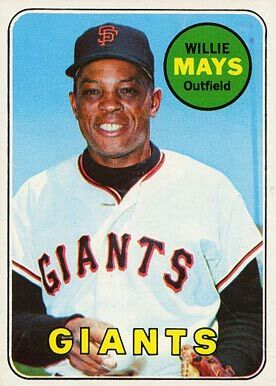 In 1951 Mays hit a respectable .274 with 20 home runs and 68 RBIs in 121 games to contribute greatly to the Giants National League pennant winning performance that year. Willie Mays in San Francisco. Mays in 1973 with the Mets. Even so, the full effect of his spectacular career did not manifest itself until Mays returned from two years with the Army in 1954. That year Mays led the Giants to the World Series title, batting a league leading .345, tagging 41 home runs, and driving in 110 runs. The 1954 Giants were a very good team, finishing first in the National League with a 97–57 regular season record. They had four future Hall of Famers on the team: Leo Durocher (mgr. ), Monte Irvin, and Hoyt Wilhelm, as well as Willie Mays. Mays, led the offense with a .345 average, 41 home runs, and 110 RBI. They faced a dominant Cleveland Indians team which sailed to the American League pennant with a 111–43 record. Cleveland was also stocked with future Hall of Famers: Al López (mgr. ), Larry Doby, Bob Lemon, Early Wynn, Bob Feller, and Hal Newhouser. The Giants beat them four games to none in the World Series. It wasn’t pretty. Mays made historian in that World Series. Most who remember it gush about the what they all refer to as “The Catch.” This was a spectacular running catch made by Mays with his back to the batter in game one. Vic Wertz hit the ball hard, Mays turned and ran toward the center field wall, made the catch, and whirled and threw the ball back to the infield as his hat flew off his head. this was the only instance in which the Mays-era Giants won the World Series. They had one of the most dominant teams of the 1950s and 1960s, but seemed to almost always finish second. Mays never looked back after his breakout 1954 season. He finished his career in 1973 with career numbers of a .302 batting average, 660 home runs, and 3,283 hits. He also received the Gold Glove Award 12 times and was Most Valuable Player in the National League in both 1954 and 1965. He was a core member of three Giants pennant winners—1951, 1954, and 1962—and enjoyed a final season with an upstart New York Mets team in 1973 that won the National League pennant but lost to the Oakland A’s in the World Series. I know that I’m being nostalgic here; I enjoy reflecting on the excitement and joy of watching the legendary Willie Mays. 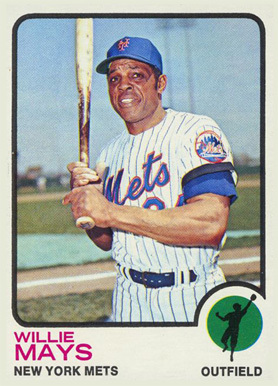 As a grand old man Willie Mays remains a hero for many of my age. This entry was posted in Baseball, History and tagged Al López (mgr. ), Bob Feller, Bob Lemon, Bobby Bonds, Bobby Tolan, Cincinnati Reds, Cleveland Indians, Early Wynn, Hal Newhouser, Hoyt Wilhelm, Joe Garagiola, Larry Doby, Leo Durocher, MLB, Monte Irvin, New York Giants, San Francisco Giants, The Catch, Tony Kubek, Vic Wertz, Willie Mays, World Series. Bookmark the permalink.